Xerafy autoclavable Roswell, the first tag of its kind, uses only its stainless steel interior as an antenna. The patent-pending tag is constructed of two cylindrical metal cases with a thin high temperature substrate between them. While existing products in the market may use a tag packaged inside a metal case, Autoclavable Roswell is completely different. Because there is no RFID tag packaged inside Roswell, the antenna-free design ensures reliability and durability by eliminating the risk of tag failure from high impact and vibration. It is also highly resistant to chemical cleaning and autoclave cycles. Roswell is designed for quick an convenient attachment and can be welded directly to metal trays or easily attached via a stainless steel bracket to a medical equipment. 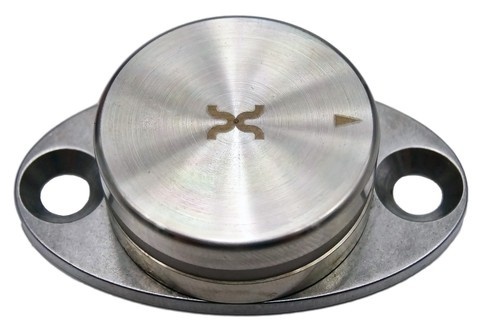 Xerafy Roswell Autoclavable UHF RFID Tag is also eliminates the need for a spacer between the tag and the mounting surface or the need for strict welding or attachment procedures. It is a rugged, metal tag that is designed to maintain its same high performance after multiple autoclave cycles. This tag is designed for quick and convenient attachment and can be welded directly to metal or easily bolted or tiewrapped to an medical asset. This tag is perfect for healthcare equipment management such as tracking of autoclavable surgical trays as it allows tracking to continue after intense cleanings. • High performance RFID on-metal tag. • 180 degree read orientation. • Resistant to chemical cleaning process. Xerafy RFID Enabling Healthcare - Safe and efficient healthcare depends on maintaining accuracy at all points in the supply chain, from pharmaceutical and operating room to central sterile services department. The right RFID solution lets you build safety and traceability into healthcare processes by enabling you to automatically track, monitor and safeguard instruments, equipments and supplies. Xerafy's innovative, autoclavable tags enable you to apply RFID accuracy, tracking and control to medical instruments, inventory control and general asset management.